A major part of my life was spent in Panaji, Goa. Our residential area was peaceful with the gentle roar of the sea in the background. It was in my early days of school when I first heard those melodious harmonium tunes combined with a powerful voice. I looked at the other children in the balcony opposite my house and we all wondered who it was. A common thought on everybody’s mind was that – here’s a beggar! He must be singing for money and what else! My mother corrected me and told me to avoid using the term – beggar. I was too young to understand her sentence completely at that time but kept it in mind. I noticed her acts of kindness were not ‘throwing coins’ to the singer as my neighbours did, but she personally went down with food, money and even clothes. She mentioned to me, “Clothes are also useful apart from money. We must share what we have, be it food, clothes or anything that could help them.” She has always been particular about treating people with equality and kindness, not just to humans, but to animals as well. She always taught me to respect people of all strata of society as even if everybody is not born equal in status or wealth, we all have to show humanity to every living being. The man and the woman with him gladly took the clothes. My mother’s acts of kindness left an indelible mark on my mind. The old man with his singing prowess made me wonder why he was born poor! With all that talent, surely he could have led a better life? The harmonium he carried was of a heavy make and he used to balance it on one thigh while standing on one leg, as he sung out loud and clear. He sang with a lot of pain and feelings and I sensed that at an early age. Even my harmonium teacher could not play as well as he could. My family did everything possible to help them at that time. Unfortunately, in those days, there were no help centers they could run to or social media sites to quickly spread the word and get help. The couple used to turn up suddenly and disappear. Time ticked by fast. From school, it was college and then graduation. I then landed in Pune for a job. One of my jobs as a writer was in a residential area in Pune. That was the time when I heard a strong, melodious voice rise up to the third floor. It sounded familiar. Then I heard the harmonium tune. The image of a handsome Raj Kapoor wavered before my eyes. I rushed down with a colleague to find out about the singer. I was tearing with excitement at this point. As I suspected, I was shocked and pleasantly surprised to see the same couple, who once sang on the roads of Goa. The man looked weathered with age. His voice remained unchanged. I felt awkward but somehow mustered courage to talk to them. When I inquired, the woman shared that they were the same couple from Goa. She was shocked to see me and recognized me. She did remember my street though. The man, however, had lost his vision due to old age and an infection. I was sorry to know that. The couple hailed from Gujarat and used the train service to travel to and fro. They had no home as their children did not care for them anymore, the lady said. I offered to help her further and collect help from my friends and colleagues. I requested her to come the next day. People from the neighboring areas gathered around them and even got the elderly person a chair to be seated, so that he could sing. Such was the power of his voice. He still carried a heavy harmonium. Sadly, the couple never came the next day. Maybe they were stuck in some other area. I tried to trace them but had no news. I only hoped to God they were safe. This made me feel so happy and I remembered my mother’s words about being kind and showing respect to everyone around me. Money and status can never define a person’s worth and talent. In this case, the man was only poor in terms of money but rich in talent! I was glad we had stayed connected with them in Goa and helped them in every little way. I thank the neighbours who pitched in to make their life a little easy and pleasant. Time and situations may have taken them on a new road altogether, but I am sure they touched many lives on the way. It’s not that we, as the society were kind towards them, they were so kind in sharing their beautiful music and making our evenings special! 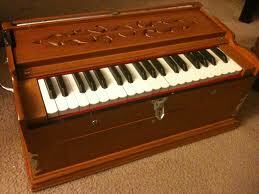 Before I moved to Bangalore, I donated my harmonium to a temple. I thought someone deserving should use it as I really did not have the talent to do justice to it. It may not be possible for every person to go out of his/her way to help others, but every little act counts. Although today’s schedules are busy, a drop in the ocean still holds value for many others who may be less fortunate than you are today.